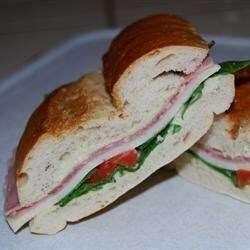 "These flavorful sandwiches can be made ahead of time and stored in the fridge for later. They are full of flavor and you can vary the ingredients to your taste." In a food processor or blender, combine the artichoke hearts, garlic and olive oil. Process until smooth. Season with salt and pepper to taste. Slice the sandwich rolls in half lengthwise, and pull out most of the soft bread from the top and bottom. Spread the artichoke paste onto each side of each roll. Place layers of red peppers, arugula, salami, provolone cheese, pepperoncini, olives and onion into the rolls. Press sandwiches together, and wrap tightly in aluminum foil. Place sandwiches in the refrigerator, and place something heavy on top. It helps to place a plate on top, then place cans or any weighted containers on top. I used cottage cheese. Chill for up to 3 hours. Unwrap, cut in half and enjoy. Quick, delicious fair food made right at home! Oh my gosh these were good! Everyone thought I bought them from the Italian deli down the street. Thanks for the awesome recipe!! Awesome COLD ...and preferably wrapped in butcher paper. Great for picnics too! My husband took these to a potluck for guys. He said they disappeared fast! I really liked the artichoke spread. Yummy! Will definitely make again. I didn't have roasted red peppers so used sun dried tomatoes in their place. Can't wait to use the peppers.